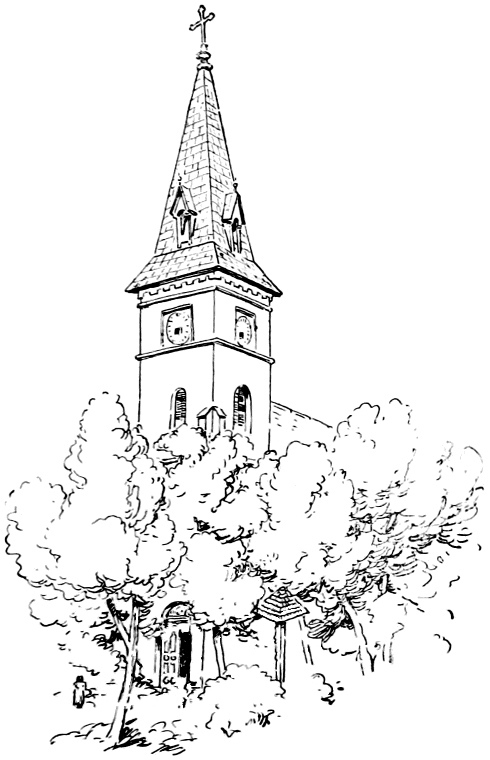 Vintage church drawing from a 1907 Hungarian book on folklore. The author of the book was Desi Malonyai (1866-1916), a Hungarian writer and art historian. He did not identify a particular illustrator though it’s clear work from several artists was included. Gutenberg puts it in the public domain in the United States. I think, repeat I think, based on his date of death (over 70 years ago), the work is in the public domain everywhere. The text identified this as a catholic church drawing. A country church with a clock tower and cross at the top of the steeple. Most of the church is covered by lush greenery. Of course, it won’t be green until you color it in but you almost see the green even in this black and white form.